With Chianti and Chianti Classico, confusion follows as the night the day. Chianti’s very name seems like shorthand, as Cab and Cabernet are for Cabernet Sauvignon. Moreover, Chianti Classico rules the shelves while the other is seldom seen. Both are DOCG, entitled to wear the distinguishing pink necklace [shown below], which doesn’t help a bit (and some prefer to go naked, adding to the confusion), and some producers make both wines. The names of their ruling bodies–Consorzio Vino Chianti and Consorzio del Vino Chianti Classico—are too close for comfort, and while the former has been on the shy and retiring side, not so the latter. Indeed, when people marvel at Tuscany’s genius for self-promotion, it’s often the Consorzio del Vino Chianti Classico that they’re goggling at. And so it is that–what with this and what with that, as Beatrice Lillie used to say–some consumers can’t tell them apart and others may be inclined to doubt or even deny the existence of a Chianti that is other than and separate from the Classico. Commence we now to sort things out and set things straight, Thirsty Reader, to ‘prune th’encircling vines,’ as it were, because some people are missing a good wet bet. Chianti Classico is grown and produced within the zone of that name (I hope you weren’t expecting me to say eponymous), which sprawls over 173,000 acres between Florence and Siena. Just over a tenth of this is, as we like to say, ‘under vine.’ The zone has widely varying soils, elevations ranging from 660 to 2600 feet, and a large corps of producers that includes innovators, purists and traditionalists. Their wine can be 100% Sangiovese but must be at least 80%, the remainder to be local grapes (Ciliegiolo, Canaiolo and Colorino) or international varieties (Cabernet & Co.). Trebbiano and Malvasia had been added for centuries because white grapes helped make the wine palatable by spring, which is when the peasants who made it intended to drink it. They did not ‘lay bottles down,’ Thirsty Reader. They emptied them. But gradually over decades the fou-fou types and connoisseurs and intellectualizing types had their say and got their way, declaring that wine had to be ‘great’ and that ‘great’ wine had to be ‘age-worthy’ and ‘capable of marked longevity’ and the like. And so the whites were steadily reduced from their traditional portion (up to 30%) to risible levels, then finally banned. Since the 2006 harvest, all have been declared uva non grata. Classico producers include some notable names–Castello di Volpaia, Poggerino, Panzanello, Coltibuono, Ruffino, San Fabiano Calcinaia, Isole e Olena, Nittardi, Vignamaggio and Ricasoli among them—and their individual prominence has boosted the general. And the Consorzio has done more than organize promotions. One of its most important efforts was the Chianti 2000 initiative, whose aim was nothing less than identifying the best clones of the Sangiovese grape. Still, the biggest reason for Classico’s dominance admits of neither argument nor excuse: Classico’s percentage of top-quality wine is higher, year in and year out. It DOCG discipline requires, among other aides to quality, requiring slightly more Sangiovese in the mix, and denser planting and significantly lower yields in the vineyards. ‘But on the other hand, not so fast,’ says my neighbor Bella Lugosi, a toothsome Italo-Romanian vamp and struggling bit-part actress. What she means to say is that Chianti—the plain sister, if you will—has had a bum deal for quite some time and a bum rap for even longer. Result: in the end or, as J.K. Stephen put it, when the Rudyards cease from kipling and the Haggards ride no more, Chianti is unknown to too many American wine-lovers. Chianti became beloved in the U.S. after World War II. GI’s who’d had the real thing (in Tuscany) brought back fond memories (the unlucky ones felled by Dago Red and Sneaky Pete in Naples and Sicily, did not). In the 1950s the Sunny Italy Era of tourism began (and most Americans went by boat. Imagine that.) College boys discovered it too. Back in the day a quaint and appealing straw-covered fiasco cost about $1.49 a bottle, maybe $3 at a red-sauce restaurant. Classico’s consorzio, then known as Gallo Nero, got busy and did an excellent job of spreading the gospel that a Black Rooster on the label meant good wine in the bottle. Chianti’s own association then tried to popularize its wine, branded Putto (a cherubic son of Bacchus), but with less success. Customers heard and heeded only the first shout, and that was Classico’s. Moreover, most accepted that as final and immutable, and never mind that over the decades since Chianti has improved steadily. Any that is exported is almost certain to be very good—and some is excellent, on a par with Classico. To dismiss it wholesale is, literally, a costly mistake. More than that, it’s self-denial without reward, like fasting in honor of Zeus or Apollo. The Consorzio held a tasting of Chiantis recently in Manhattan’s Michelangelo Hotel. The speaker at or leader of the tasting was Daniele Cernilli of Gambero Rosso, the Italian wine/dine magazine: one of the 50 most-influential men in winedom. He noted that over-priced, over-oaked wines were declining in Italy, with more producers returning to simpler, drinkable wines that reflect terroir and belong on the table. Such words get under my skin a bit, because I’ve heard self-important folks using ‘food wine’ dismissively—meaning palatable but hardly worthy of attention. That’s not Daniele’s attitude: He knows as well as anyone that wine belongs with food. It is the table’s civilizing grace. Yes, there are times that call for curling up alone in the wing chair to think dark and brooding thoughts over a dark and brooding wine—the kind Italians call a vino di meditazione—but I’m pretty sure that they aren’t sufficient to sustain life. Chianti often costs a lot less than its upscale brother. Some of those tasted were at/below $10 a bottle (one only $7); those that were more were not much more. (Oh, OK, one hit $20.) Perfect for these times. Overall, Chianti represents more than value for money. It very often gives more than you pay for or expect. Here’s how to identify them, subject, from time to time, to the Italian Exception (i.e., there are rules, and there are rules). There are seven Chiantis, six geographic and one trans-geographic, all based on the same rule for grape varieties and percentages thereof: a minimum of 70% Sangiovese, up to 10% Canaiolo Nero, up to 20% other authorized red varieties (indigenous or international) and up to 10% white Trebbiano Toscano and/or Malvasia del Chianti. 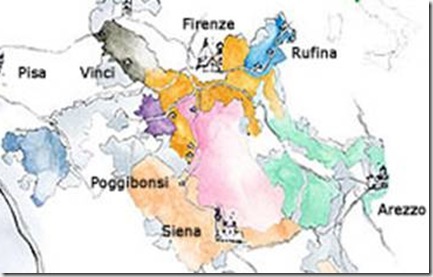 The wine’s regions or subzones cluster more or less around Florence and its Colli Fiorentini. 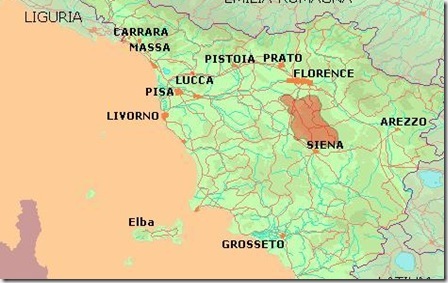 My favorite, east of Florence, is Rùfina, source of Villa di Vetrice, Selvapiana and Frescobaldi’s Nippozzano. 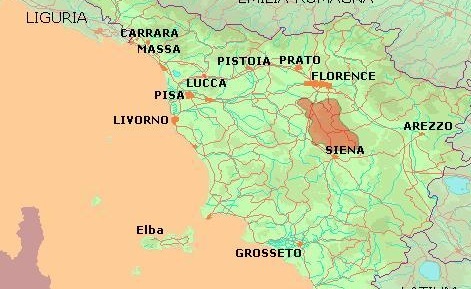 Continuing clockwise: southeast is Colli Aretini; due south is Colli Senesi; Montespertoli is southwest; Colline Pisane, far west; and finally Montalbano (northwest, around Prato and Pistoia). Producers are entitled to name the zones on their labels, but many don’t, just as some ignore the DOCG necklace. Rùfina producers almost always label the zone, as do many in Colli Senesi. Roberto Giulio Droandi of Mannucci Droandi told me that he is particularly proud of his zone’s heritage and terroir, and so his labels were the first to be labeled ‘Chianti Colli Aretini.’ Too few others, there or elsewhere, have followed his lead; thus there are unspecified zone Chiantis mixed in with the trans–geographic Chiantis, which are made from grapes grown in any two or more zones. Chianti’s many subzones: Colli Aretini: pale green; Colline Pisane: light blue; Colli Fiorentini: orange; Rùfina: blue; Colli Senesi: apricot; Montalbano: gray; Montespertoli: lavender; Classico, like a good steak, is pink in the middle.